Do you envy your friends’ selfies at their latest travel destination on your Instagram feed, but you don’t have the fund to go on one? Are you stuck at your desk at work, daydreaming the day you get to breathe the fresh air of holiday? Are you one of those students who wish they can travel with a giggling group of friends (including the crush) during their semester break etc.? As a certified frugal who gets bored easily, I totally understand the wanderlust, yet the limitation in terms of money. Here are tested and guaranteed tips on cutting travelling cost, so that you get to go on that holiday at last! Some places are cheaper but offer almost the same experience with their alternatives. Research thoroughly and choose the place that appeals to you the most but with a good price. Also, go local and save more money while supporting the local tourism industry. There are lots of exciting places in Malaysia that you should not miss out on. Be proactive and keep updated on promotions. Sign up for travel newsletters, websites, or pages which will keep you in the loop on any promotions and happenings. Some websites will also grant you redeemable points to cut cost for your travels or promo codes that will earn you discounts on purchase. 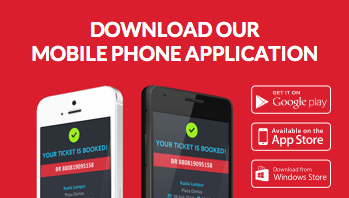 Check out website or mobile app to book your bus tickets in a convenient, fast, and secure way. Via CatchThatBus, you will not incur extra charges to what you are paying at the counters. You will also save on expenses, time, and effort to search and book your tickets. Plan your trip the super easy way – at your fingertips. You may also opt to travel during off-peak periods to avoid extra charges and unavailability due to the high demand. Try not to travel during school holidays, festive seasons, and long weekends. Do your research and make a comparison of the available accommodations based on your goal. Sometimes, slightly expensive accommodation may save on your transportation costs if it is closer to your places of interest. Choose your accommodation according to your budget. Nowadays, numerous cheap options such as dormitories, cheap hotels, homestay, and etcetera are available. You may also book your accommodation on websites offering discounts such as Agoda, Trivago, and more – don’t forget to check the reviews as well. At times, bundled packages including transportation, accommodation, food, entertainment ticket etcetera may cost cheaper than if you plan them one by one. Explore your options and choose wisely! Don’t forget to negotiate for discounts, especially if you’re travelling in a group. Unless this is a foodie trip which entails luxurious, expensive meals, you can definitely cut cost on food. I know friends who bring their “travel staples” every time they are on a holiday. For instance, you can bring bread, serunding, instant noodle, biscuits, instant meals, snacks and more! Alternatively, use the Internet to search for cheap and good places to eat and plan your travel accordingly. You’re most likely to end up at expensive eateries if you simply “follow the flow”. One neat tip I gathered is to look out for lunch specials and deals if you are lunching at expensive eateries. They are served at great prices as opposed to the normal price during dinner time. Furthermore, don’t forget to bring your own water bottle and refill it at proper places to minimise the cost of buying bottled water. You can save a lot of RMs by practicing this. Never settle for more when you can pay less. Watch and learn how people blend in to not be charged with the “foreigner’s price”. You will get a good laugh out of it, too. Carpool if you’re driving and divide the costs accordingly. Consider moving around using public transport or renting a car if you’re in a group. Better yet, exercise your feet and walk around for a good workout which is equally beneficial to your wallet as well! If you’re going to places with tickets or passes for entrance such as Legoland and more, look for good deals by pre-booking or search for promotions. Don’t skip the breakfast provided by hotels; you get a wide selection of buffet while saving on breakfast expenses. Also, opt for free Wi-Fi at the hotels or restaurants you visit instead of purchasing more data plan when you run out of internet from the excessive photo uploads. Try out these tips to get the most out of your money during the travel. Our team at CatchThatBus wishes you a fun, safe, and economical travel!